The UPDF on Wednesday begun withdrawing from the Central Africa Republic where it has since 2012 been part of the African Union Regional Task Force hunting for elusive Lords Resistance Army leader Joseph Kony. 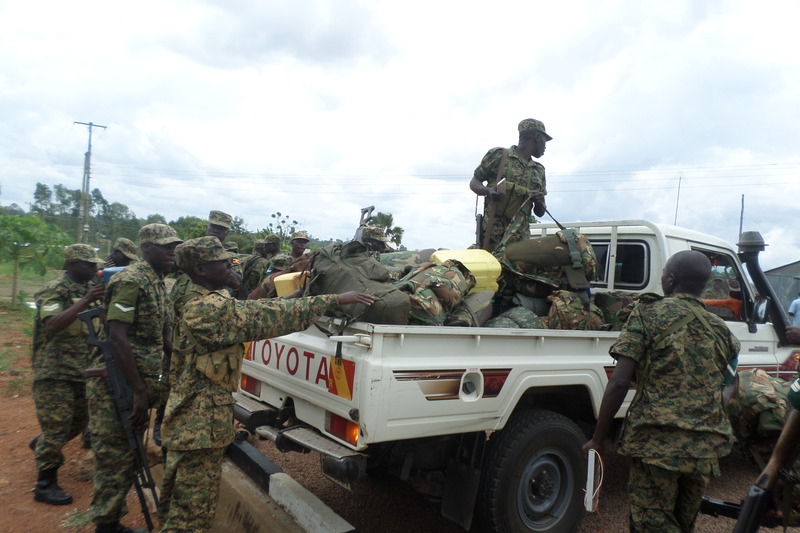 The first batch comprising of 50 soldiers landed at Gulu Airfield in Gulu town and were welcomed by the Chief of Staff Land Forces Brig Katsigazi Tumusiime and 4th Infantry Division Commander Brig Emmanuel Kanyesigye. Brig Katsigazi who addressed the press shortly after receiving the soldiers said the decision to withdraw the soldiers from CAR was premised on the realization that the mission to ‘‘neutralize’’ the Lords Resistance Army(LRA) rebels had been achieved. Brig Katsigazi said the decision[ to withdraw] had been made by the UPDF’s Commander- in- Chief, Presdient Museveni. Brig Katsigazi praised the soldiers for their peace roles in CAR and described them as heroes who liberated not only Uganda but other African countries. He however didn’t specify the numbers of soldiers who will be withdrawn from Obo saying that the UPDF Chief of Defenc Forces Maj Gen David Muhoozi will give briefing on that. He did not say when this would be done. The UPDF spokesman Brig Karemire said Kony is currently moving with less than 100 armed fighters, saying the once feared and dreaded rebel leader is now weak and ineffective. UPDF soldiers were first deployed in CAR in 2009 with a mission to capture or kill Kony. In 2010, the US government sent 100 of its Special Forces soldiers to support the UPDF in intelligence gathering on LRA activities in CAR. The withdrawal of UPDF from CAR is likely hinged on the a change in US foreign policy in the Great Lakes region. New US president Trump has emphasized that he will focus on America implicititly implying a lesser US role in far flung parts of the world where US interests are not directly under threat such as in the Great Lakes, such as the hunt for Joseph Kony.